It took one full day of racing to decide it, but three SCCA members earned a new watch on Sunday at Daytona International Speedway during the Rolex 24 Hours of Daytona after winning their IMSA Tudor United SportsCar Championship class. Seven-time Pirelli World Challenge race winner Kuno Wittmer, two-time SCCA Pro Racing Trans Am 2 champion Cameron Lawrence and nine-year SCCA member Ben Keating teamed up in the No. 93 TI Automotive Dodge Viper SRT, along with Dominik Farnbacher and Al Carter, to take home the win and the famous prize in GTD after 704 laps, or 2,506.24 miles, around the 3.56-mile circuit. 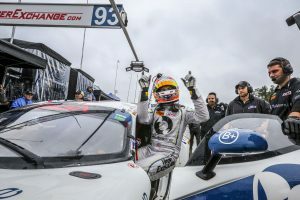 The team started the race at the back of the field, but made the most of their time and found themselves in the lead, with Wittmer at the wheel, six hours into the race. The Viper swapped the lead in the closing hours with the No. 22 WeatherTech Porsce 911 GT America co-driven by Cooper MacNeil, who also runs in the SCCA SafeRacer Club Racing program, through pit strategy before ultimately finishing 7.588 seconds in front. Pirelli World Challenge competitor and race winner Mark Wilkins looked poised to take a win in the Prototype Challenge class until, with under 20 minutes to go, teammate Colin Braun had an incident trying to close out the race in the No. 54 Composite Resources/Flex Box ORECA FLM09/Chevrolet. Braun was hit and spun, possibly breaking a suspension piece, then spun into the wall exiting the bus stop to end their race for good. The unfortunate ending to the 54 machine, who fell to third at the finish, elevated the No. 16 Autosport Designs Inc./Top 1 Oil ORECA FLM09/Chevrolet co-driven by former Trans Am champion Tomy Drissi to runner-up. The event was scattered with former SCCA National Champions whose teams or machinery didn’t place at the top of the endurance test. Former American Sedan National Champion Eric Curran finished fifth in the Prototype class in the No. 31 Corvette Daytona Prototype, while three-time Runoffs champion Scott Sharp was out after 13 hours in the No. 41 Honda HPD ARX Prototype and outside the top 10. In the GTLM class, past Formula Atlantic National Champion and IndyCar star Graham Rahal’s team battled through issues to finish fourth in class but 24-laps behind the leader in the No. 24 BMW Z4 GTE. 1993 Formula F National Champion Anthony Lazzaro had the No. 63 Ferrari 458 Italia in front of the GTD class early in the race, but ultimately finished 13 laps behind the class leaders. Tire Rack SCCA Solo National Champion Robert Thorne helped his No. 45 Audi R8 LMS to 10th in the class, two positions ahead of three-time Runoffs Champion Boris Said’s No. 97 BMW Z4. IndyCar stars Scott Dixon and Tony Kanaan teamed with NASCAR racers Kyle Larson and Jamie McMurray in the No. 02 Target/Ford EcoBoost Riley/Ford captured the overall win, covering 740 laps (2,634.4 miles) in the 24-hour period. That team, of course, is owned by 1979 Runoffs podium finisher Chip Ganassi. A Need for Speed! Local Race Car Driver Wins Big at Daytona.